Wanderlust Azores- Caldera of Guilherme Moniz on The Terceira Island, Portugal. Go Milk Your Cows Where Your Cows Are. The Terceira Island is a center island among the nine islands that belong to the Portuguese Azores Archipelago, located in the North Atlantic ocean. Azores are only a four-hour flight east of Boston, MA, and a two-hour flight west of Lisbon from the mainland of Portugal. In the middle of the Terceira Island is the Cauldron of Guilherme Moniz, with 15km diameter, formed by the eruption of the Algar do Carvao volcano. This is the panoramic view of the caldera. Here is how windy it is at the lookout point for the caldera. With the population of 56k, the Terceira Island has double the number of the cows. 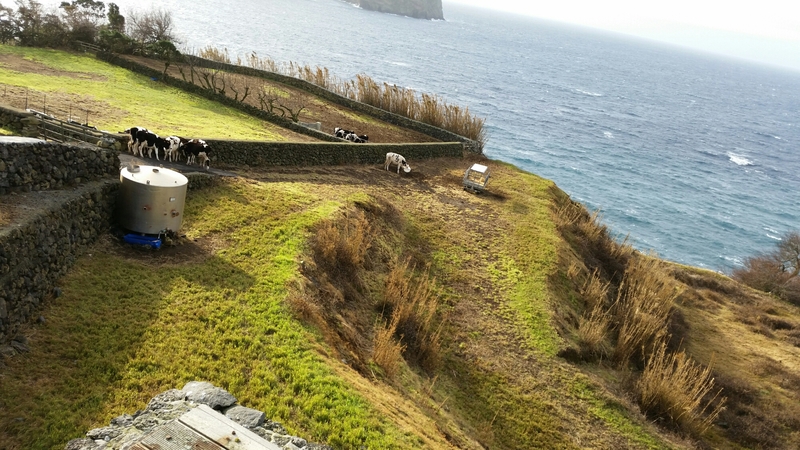 Milk production is the primary output for the island’s economy. The cows are free range and feast on the vegetation of the caldera. The farmers bring their mobile milking device to the cows, twice a day. This is a true definition for being MOBILE- Go Milk Your Cows Where Your Cows Are. Sadly, most farmers are considering changing milk production to meat production because their profit is only about 20 cents per liter with each cow producing 40 liters of milk on average per day. Even sadder, the Terceirian farmers used to produce wheat for cereal, exporting to the rest of the Europe which was highly profitable. However, since joining the European Union, Portugal had to agree to cease wheat production and change to milk production. Now, their milk only supplies the Azores and a few supermarkets on the mainland of Portugal. This is an injustice caused by a socialist economic practice, benefiting the strong and the ones in power. Previous Previous post: Wanderlust Azores- Day One Food Adventure. Well, Disappointment is More Like it.